1. Break up the cake, place in a food processor and whizz to give fine crumbs. Place the dark chocolate in a small bowl and melt over a pan of just simmering water, or in short blasts in the microwave. Add to the crumbs, mix well, then stir in the chocolate chips. 2. Roll the chocolate mixture into 24 small balls and arrange them on a baking parchment-lined baking tray or plate. Chill for 30 minutes until set. 3. Melt the white chocolate in a bowl over a pan of just simmering water, or in the microwave. Dip a cake pop stick into the melted chocolate, about 1.5cm in, and push into a cake ball, then dip the ball into the melted white chocolate to coat thinly. Allow any excess chocolate to drip off, and spin the cake to even out the surface. 4. 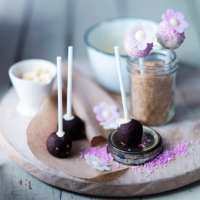 Stand the cake pop in a glass (half-fill it with sugar to keep the stick upright), dust with some shimmer sugar and add a wafer daisy. Repeat with the remaining cake balls and chocolate — you may have to melt the chocolate again if it starts to harden before you have finished. Leave the cake pops to set.